Philadelphia's beverage tax is in effect. PHILADELPHIA (WPVI) -- Philadelphia's new beverage tax is now in effect. It adds a penny and a half per-ounce charge on sodas, diet sodas, juices and other sweetened beverages for distributors. A distributor, as described by the city, is any person who sells sweetened beverages to a dealer. Mayor Jim Kenney's office says distributors are not required to pass the tax on to dealers, such as delis, restaurants, or grocery stores. The 1.5-cent-per-ounce tax amounts to 18 cents on a 12-ounce can of soda or $1.44 on a six-pack of 16-ounce bottles. Boulder, Colorado, and three California cities - Albany, Oakland, and San Francisco - approved soda taxes in the November election, joining Philly and Berkeley, California. However, more than 30 cities and states have rejected beverage taxes. The mayor's office says the new tax money will help pay for Kenney's universal Pre-K goal. The office also says the money will kick cash into Community Schools, recreation centers, parks and the city's library system. A court has already rejected a claim by the American Beverage Association that the tax duplicates the current state sales tax. The beverage industry, and some businesses they supply, say the new tax will hurt working families and cost jobs. Supporters say it's sure to cut into the obesity epidemic. 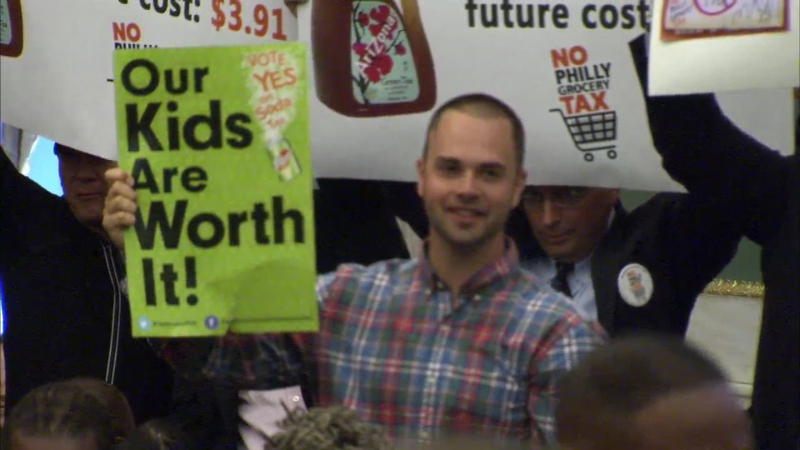 Those on both sides of the beverage tax issue made their voice heard in poster form during the vote at Philadelphia City Council. How will sugary drink tax money be spent?